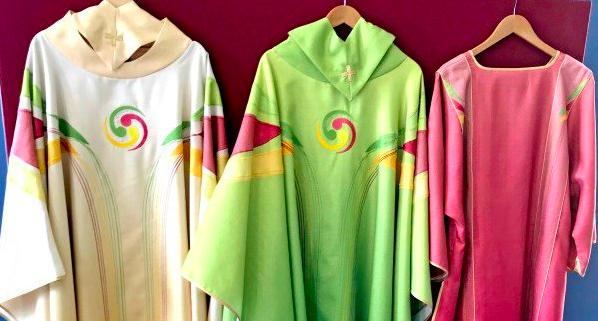 New vestments at WMF in Dublin – the beginning of another prophecy fulfilled. We have seen many prophecies from the Book of Truth fulfilled. (see our home page – menu – prophecies fulfilled). Of course, we should not be surprised – but we always are. We are angry, saddened, and react in any way we can – in blogs, petitions, and financial help to those who try to alert us to events and dangers. The latest, is of course, the vestments to be worn at the closing Mass of the World Meeting of Families in Dublin. “… the spiral symbol in the middle is apparently a pre-Christian Celtic symbol found on Neolithic monuments across the island.” In other words, a pagan symbol. The pastel colours are very unmanly/effeminate. I think it was deliberate (colours and imagery) but I didn’t know if I was just interpreting it in light of the latest sexual homo-abuse allegations. The fact that no Christian symbol is on the vestments definitely is deliberate. There are rules in creating vestments and I don’t believe anyone accidentally forgot about Christ And the Eucharist when designing them. No: they denied Him deliberately. Of course, this wasn’t the first time. 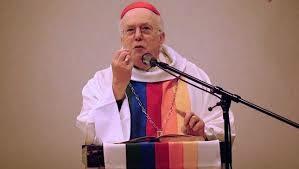 Cardinal Godfried Danneels, the emeritus archbishop of Brussels, was a personal appointment by Pope Francis to the Synods of Bishops on the family. For comment on other part of this prophecy for- Holy Missals, the Bible and Holy Crosses see our next post: Is this also Fulfilling Prophecy? Part 2. This will be posted tomorrow.